There’s a place in Burlington's South End known for its $3.75 banh mi sandwiches. The eatery, M-Saigon Vietnamese Restaurant, is located on Shelburne Road, across the street from the end of Flynn Avenue, and shares a parking lot with Union Jacks, among other businesses. 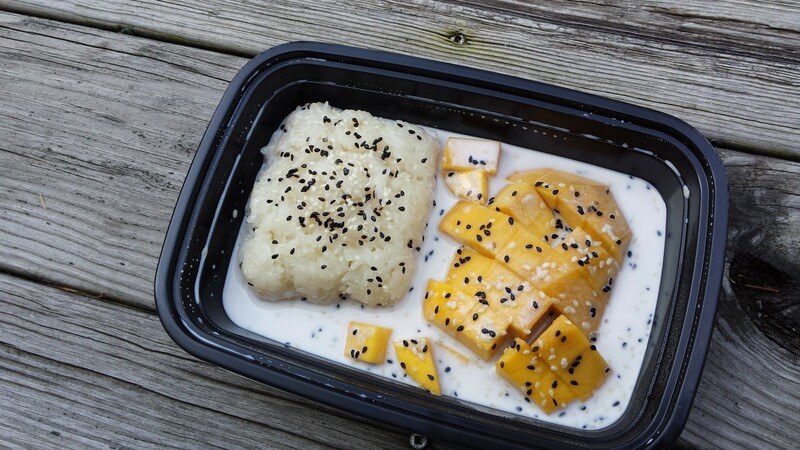 The mango and sticky rice here is a dish not to miss. Five dollars and change gets you a hefty glob of rice and half a fresh mango, the fruit chopped into bitesize pieces. Both are covered in a sweet coconut sauce that has just enough salt to contrast with the sugary flavors. Black and white sesame seeds dot the top and add crunch. While the rice is "sticky," it comes apart easily enough. The stick is sufficient to bind the grains together, and not the kind that leaves food glued to the top of your mouth for hours. This texture is the result of soaking the short grain sweet rice for five hours before cooking, according to owner Khoi Nguyen. Otherwise, there's no fancy technique. After its long bath, the rice is cooked on the stove for 30 minutes, he says. This is a dessert, but it's almost enough to make an entire meal. Every bite delivers sweet, salty, sticky, crunchy and soft. I’ve had the banh mi and thought it was fine, but the sticky rice is memorable.